Back in the day when we talked on cell phones (not smartphones) and used voice (not data), the term “roaming” had a limited impact. It generally referred to accessing a different network carrier for voice calls when outside the geographical coverage area of one’s own service provider. If roaming calls cost more (and they usually did), at least we were aware of the difference. We could choose to make a roaming call or wait until we returned to the realm of our network to dial out. But today’s mobile devices are essentially portable computers connected to the cloud with apps running frequently if not constantly. 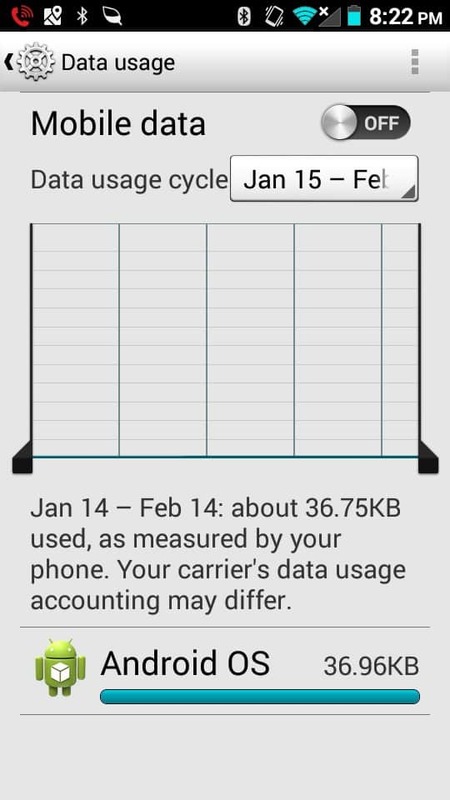 Not only do background apps drain battery life, they can devour one’s data plan. Too, many users drift back and forth between Wi-Fi networks and cellular networks without knowing if they’re using data allotted to their plan or taking advantage of a provider’s “free” Wi-Fi. Data roaming is a significant issue, particularly when abroad. It’s a big concern for travelers who are unaware of the high cost of data roaming charges until the bill comes home to roost. So it’s important to recognize the significance of data roaming and how to minimize its cost. The easiest way to lower cellular data roaming charges is to use Wi-Fi whenever possible. Not only is this a good idea when traveling abroad but it’s a good practice to keep when closer to home. If you can use Wi-Fi at work, or in cafes or while commuting, you may find that your data usage on your carrier’s cellular network will drop to the point where you may decide to migrate to a less expensive plan with lower data limits. Wi-Fi is generally free in most places (although we’ve discussed privacy concerns associated with unsecured Wi-Fi) that offer the service; use it whenever possible. When one exceeds the data limit on their mobile device plan, the cost of a small overage won’t break the bank account. But data roaming abroad, as the video above indicates, can have a catastrophic financial impact. 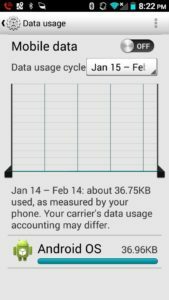 The slightest bit of data usage can rack up exorbitant charges since most domestic data plans don’t include connections to the networks found in other countries. Should your phone go into data roaming mode whilst outside of your home country, your phone company can charge you ridiculously high rates. One report indicates a mobile device user was charged $20 per MB for data roaming as compared to $9 per GB for domestic usage. Note the difference in increments—a GB of data charged at $20 per MB equals a whopping $20,000! 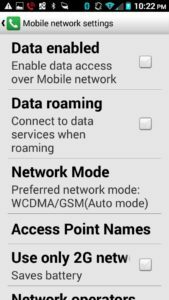 To completely block the possibility of any cellular traffic, follow these instructions: Go to the Settings App => More => Mobile Networks and uncheck the boxes by “Data enabled” (“Enable data access over Mobile network“) and “Data roaming” (“Connect to data services when roaming“). Note the following message associated with Data roaming: “Allow data roaming? You may incur significant roaming charges! If select Yes, turn on Data Roaming.” See the screen below; note boxes are unchecked. You have now been warned. Apple has installed safeguards to lessen the likelihood of iOS devices devouring data with the “Wi-Fi Assist” function. 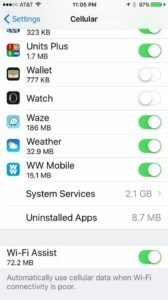 Found in iOS 9 and later, it automatically switches the iPhone or iPad to access cellular networks in case of a spotty Wi-Fi signal. If the icon in the status bar is the Wi-Fi symbol, you’re okay. If the icon says 3G or 4G, beware! You’re on a cellular network and any data used counts toward a data cap. 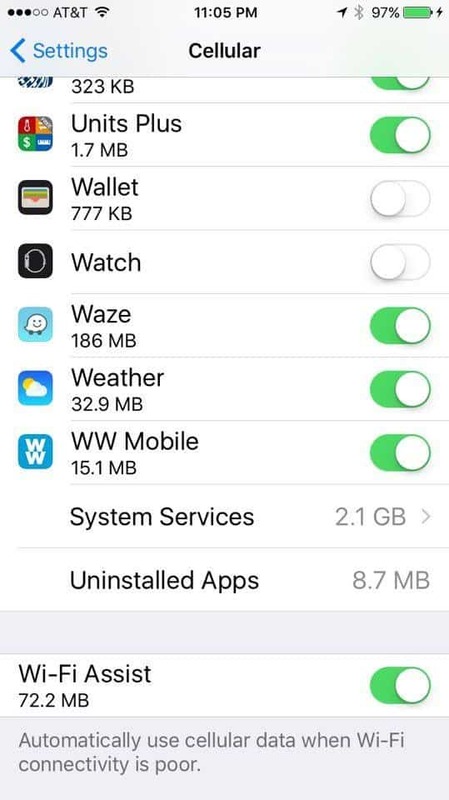 Wi-Fi Assist—by default active—is only activated when apps are running in the foreground. It doesn’t activate with background downloading of content, doesn’t activate when data roaming and doesn’t work with 3rd party apps that gobble up data (think audio and video streaming and email attachment downloads). But it’s better to be safe than sorry, especially while abroad. 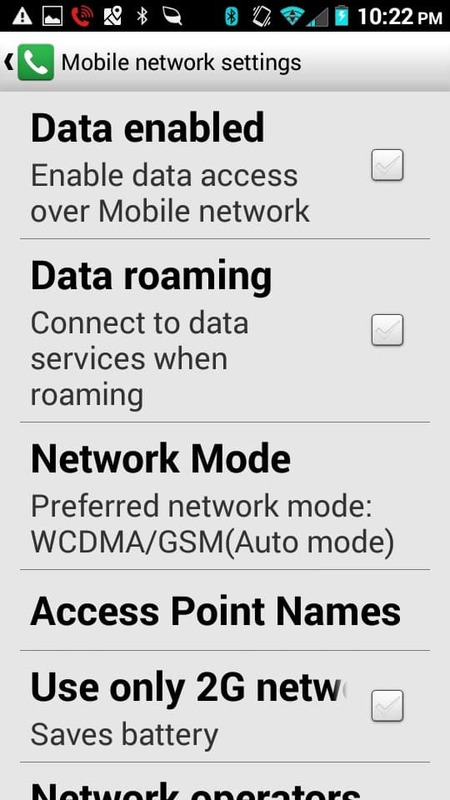 Go to Settings => Cellular => Wi-Fi Assist (should be at the bottom of the page) and turn the function off. 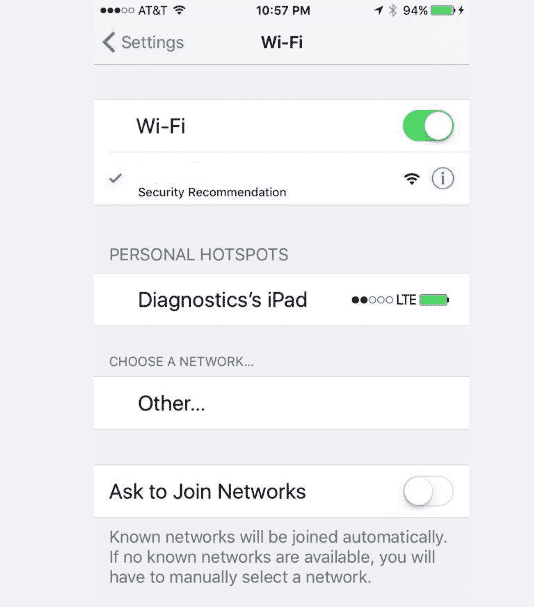 Below the Wi-Fi Assist function is: “Automatically use cellular data when Wi-Fi connectivity is poor.” Make sure the toggle switch is on the left (white) to disable this function. Note below that Wi-Fi Assist is enabled. As with Android, in case you want to make absolutely certain that no roaming charges are incurred, an iOS user can turn off all cellular data thereby leaving Wi-Fi the only avenue of connection. Again, it’s a simple procedure. Go to the Settings app => Cellular => toggle the Cellular Data switch to off (white). Of course at times it may be necessary to make or receive calls while away. By putting the Android device on Airplane Mode, you will receive only Wi-Fi. If you use a hotspot or the Wi-Fi in a hotel or cafe, you can use a VoIP service such as Google Voice for making phone calls. According to Melanie Pinola of lifewire.com, Google Voice permits users “to have a phone number that can be forwarded to voicemail and sent to you as a sound file via email—which you can check via your Wi-Fi access.” Should users need cellular data access, activate data roaming only when necessary by going to the default data-capable mode and then returning to Airplane mode when done. The straightforward procedure is similar in iOS. 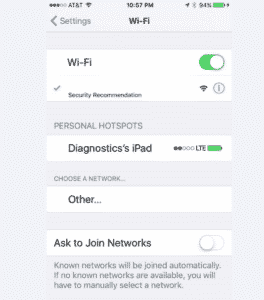 Go to the Settings app => Wi-Fi => toggle to On-green (in iOS 7 and later) to activate Wi-Fi and begin searching for available networks. If any networks are available (either public or private) they will appear on the screen after a brief pause. Tap a public network for access; for a private network a passcode is required. Once logged into a network the user, as shown below, may migrate toward a VoIP service for phone calls. For Luddites who tremble at the thought of “tinkering” with their devices lest they activate some sort of built-in doomsday self-destruct switch, there is an alternative. A prepaid international wireless broadband plan with no contract is a sensible option. Plans are available from the same carriers who were only too glad to gouge you for data roaming on your existing wireless plan. A website—prepaid-wireless-guide.com— stays abreast of the latest developments from carriers across the globe, keeps travelers informed and saves them money too.